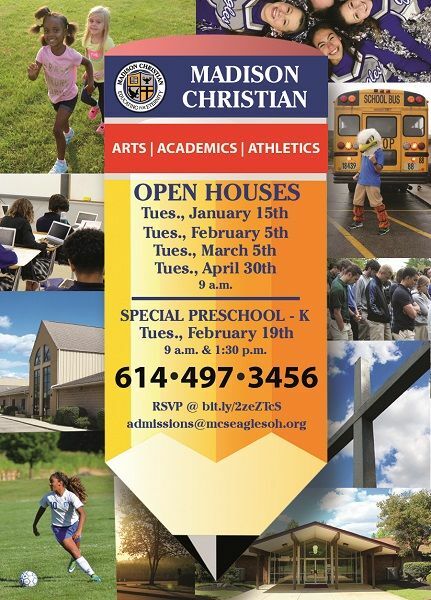 Enjoy a tour of Madison Christian School's 64-acre campus, meet elementary and junior/senior high school principals, talk with the Head of School, visit grade-specific classrooms and much more! See why Madison Christian School prepares students for life in a safe environment. Since 1978, Madison Christian School has offered a balanced college preparatory education with a Christian worldview. RSVP for open houses here! Recognized as a Top Workplace for 2017 by Columbus C.E.O. Magazine! Madison Christian School (MCS), located in Groveport, Ohio in southeast Columbus, welcomes students of all ages from central Ohio and beyond. Established in 1978, MCS has a respected history as an excellent Christian school characterized by a strong biblical foundation, a rich fine arts program, a strong athletic program, and a variety of academic and leadership opportunities. Madison Christian School serves 535 students from preschool through 12th grade. MCS appreciates the diversity of the student body which is comprised of 122 area churches and a variety of ethnic backgrounds. Madison Christian School believes diversity adds to the overall strength of the MCS program. Madison Christian School exists to glorify God and to nurture His children by providing a unique educational environment combining high academic standards with God’s Word of Truth in an atmosphere of love.